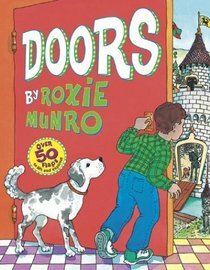 Doors is a perfect book for kids around the ages of 6 to 12. I say this because it has a decent length of words for the kids to read, and lots of color and texture as to where they won't lose attention. Within the reading the children are asked to find an apple and a hat or other random stuff from different scenes as you turn the page. The opposite page has little doors, or pop-ups if you will, for kids to lift and find these items. So, over all this book is an attention-grasping, worth-your-time book to read; and I give it a R.
Note from Alysa: Ooh, this sounds fun! My older son no longer wants to rip the flaps off of books like this, I wonder if he'd like it. That reminds me that I've been meaning to read Press Here by Hervé Tullet, which sounds similar. Thanks for letting me read (play?) Tullet's other book, The Book With A Hole, with you!